Back to handing out awards for crochet fabulousness! CLF member LittleThingies has a great example of what can be done with simple motifs. These examples are a simple hexagon motif (the pattern for which is on the project page on Ravelry.com, but you could use circles, triangles, squares, polyhedrons, octogons, oh heck any thing that fits and looks good as an embellishment! I love what she did to the sneakers! Congratulations! I award you, LittleThingies, with the Hookalicious Award for creative and fun crochet! Also, if you haven’t seen the recently updated CLF Website, I finally was able to get photos up to represent what will be taught in our classes during the CLF retreat! You can check that out here! Minuet a beautiful summer project! CLF Member Vashtirama (aka Vashti Braha) does it again with this gorgeous design! Now, granted there’s no pattern yet, because as per her ravelry.com page, Vashti was experimenting and fell in love with the stitch pattern. The resulting garment is GORGEOUS. I can’t wait to see what else happens from this “experiement”! 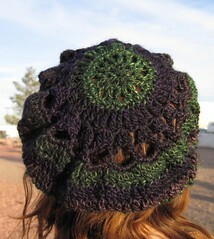 Vashti I duly award thee my Hookalicious award for beautiful and inventive crochet! Great summer inspiration! As I get to organizing the web survey for voting for the 2010 C rochet Awards, The annual Flamies, I thought I would switch things up a bit and blog a little more individually about the various categories. Now I certainly can’t get every category blogged solo before next Monday when voting begins, but I can get a few fun photos up here, and some interesting posts that will help inform you, the crochet public, about the nominees. Once again I want to stress, we have a lot of categories, and you don’t have to vote for every one of them. If you don’t feel qualified for one category you will for another. 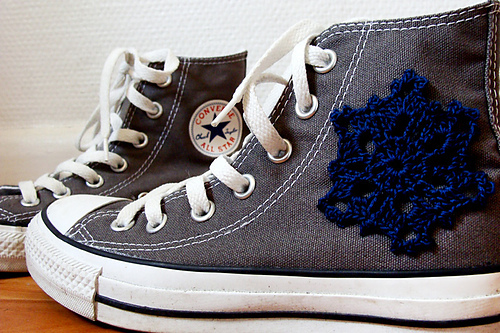 Such as the one we’re featuring today, the Best Crochet Design (for Adults) of 2009. What qualifies you? We’ll you’ll love one or more of them, or not, you have an opinion, use it. What a slate! What a SLATE! Congratulations to the designers who’s designs were nominated. We have some pretty picky folk in the CLF! Ooooh, I’m getting excited! Stay tuned for more great Flamie News, here at the CLF Blog. Don’t forget to check out our website, http://www.crochetliberationfront.com there you can grab a download of our book, or register for our retreat this coming october! Check out our Crochet Friendly LYS list, and our video links! And the Winner is! Baby Got Drape! CLF member Hapikamper shows us that indeed texture and drape work! Ok, I agonized, I tossed, and I turned. It was so hard to decide who won the competition! All of the examples were excellent! Thank you to all who entered the competition! 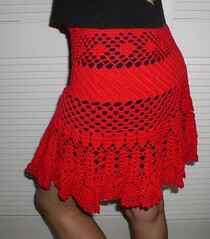 Many of those entries can be seen on our new blog page: Crochet & Drape. Without further ado…The first place winner of the Baby Got Drape Competition (and recipient of our First Ever Book) is: Leslie P. aka Hapikamper! Her Copenhagen Jacket is really fabulous! 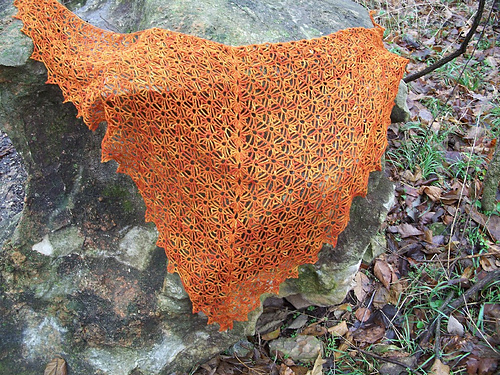 It shows that a solid, and textured stitch pattern can indeed be drapey! Congratulations Lelsie, this is a wonderful example of drape! My second pick (and recipient of a CLF T-shirt), is by Sarah C. aka Ms. Busyfingers, who used a Merino/Silk yarn that she dyed with Lichen to make this goreous dress. She designed the dress inspired by Angela Best’s Teal Leaves Sweater. She used a 3.5 mm hook with the above mentioned sock yarn! CLF Member Ms. Busyfingers proves lace and drape. Thank you to all of those who submitted photos! It was hard to choose winners, because each entry was fabulous! Your wonderful work is on it’s own page now!